Peter Heck recently wrote am article titled “Is It a Sin to Vote for Democrats?” on his page, The Peter Heck Show. First of all, what is a Christian Democrat? The term itself brings images of a racing tortoise to my mind. It ain’t gonna happen. I don’t know who Peter Heck is, but I can assure you “supporting the gay and abortion agenda is putting their soul in jeopardy”at serious risk of eternal damnation without a doubt. I hear every election year about how the Republicans are against the poor, and as Vice President Joe Biden said, the Republicans want to put us all in chains.” Reality check Joe – the Republican party was formed in part to end slavery. No, I am not middle-class, if I had to choose a class for my title it would be lower-class. I have multiple medical conditions including Obstructive Sleep Apnea, Heart Failure, and High Blood Pressure. I receive no benefits and live in my mothers basement. Mt wife makes $55.00 too much to qualify. Maybe we should divorce, it’s a piece of paper and God knows our hearts. I neither need nor want my tax monies paying for “safe” abortion. Safe for who? Certainly not the child. 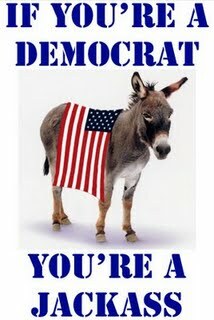 Anyone can read the 2012 Democratic National Platform at the above link. Don’t forget that this party booed God three times, then they did the same to Jerusalem, the eternale capital of Israel. Abortion, stem-cell research, Lesbianism, Gays, Homosexuals, Transgender and Transvestite people are who “Christian” Democrats are directly supporting crimes. Euthanasia, gender-specific abortion, illicit drugs, etc.. Any organization that supports these issues is guilty of their commission, likewise, anyd “Christian” who supports these issues is guilty of these crimes and transgressions and will answer to Almighty God for their actions. “You shall not lie with a male as with a woman; it is an abomination. Fortunately, our Creator God will release us from sin, if we repent, turn to God, and accept His plan of Salvation. Paul the Apostle really ‘put the icing in the cake with this passage. He wrote, Therefore God sends them a strong delusion, so that they may believe what is false, in order that all may be condemned who did not believe the truth but had pleasure in unrighteousness.